Bechdel Test: Pass-There is a brief conversation (more like jibes) between Zoya and Genya that is not about men. My major problem with this book, and it’s an ongoing theme throughout the trilogy was the pacing. THE PACING. I love Leigh Bardugo, but man did she have an issue with pacing these books. The chapters are ridiculously long, like getting on for 20 pages in most cases and yet NOTHING HAPPENS. The entire first two chapters was Alina wandering around in caves with The Apparat which added nothing to the story and quite honestly could have been skipped. I really didn’t see the point of the Apparat at all, he added nothing to the story. It took me at least half the book to finally get engaged with the story, which considering the book is only 350 pages long, is a bit ridiculous really. I also thought Alina should have struggled a bit more getting her powers back, considering that was quite a big cliffhanger at the end of the last book, but it takes no time at all and suddenly she’s more powerful than ever again? Nah. I do love the dynamics between the characters, especially the Grisha, they have such great banter and that really helped to break up some of the bleaker parts of this book (of which there were many). Zoya in particular was a delight, I can’t wait to see more of her and Nikolai together in King of Scars, because their humour will just gel so well! The diversity in this series isn’t great, but we do get some minor lesbian rep in this book with Tamar and Nadia, so that’s better than nothing and I know Bardugo has got better on this front from reading Six of Crows. I did find however that it was quite difficult to follow the ever expanding cast of characters and Bardugo might have been better just focusing on the core few. Speaking of Nikolai, there was nowhere near enough of him in this book! It takes six chapters for him to even appear, only for him to be taken out of action by The Darkling, and then basically just pop back up for the end of the book. He has some amazing moments, particularly when he confronts his father and takes the throne, but I felt like he wasn’t used to his full potential in this book. I didn’t really get the point of what Leigh Bardugo did to him in this book, it seemed more for shock value than anything else, and to get him out of the way of the main narrative, though it was nice to finally get context of where the “King of Scars” name comes from. I’m looking forward to finally seeing Nikolai do some “kinging” (yes I know it’s not a word, just let me use it anyway) in King of Scars, because he doesn’t really get that in this book. Mal is still well, Mal. I find it quite ironic that his name, in Spanish means bad, because that’s exactly how I find him, so it’s really quite fitting (and yes, I know this book is Russian inspired, not Spanish inspired, but I just thought it was quite fun that was the translation). I didn’t find him as infuriating as in the last book, but I still don’t really see the chemistry between him and Alina, Alina and Nikolai have much better banter and things are so much easier and less angsty between the two of them. 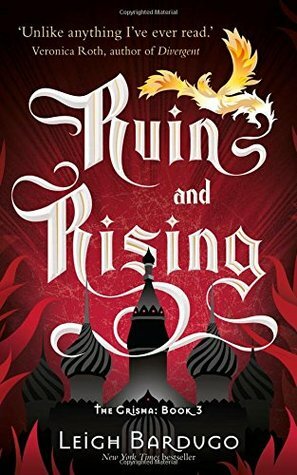 Considering that so much of this book relies on how invested you are in Alina and Mal, that was a bit of a problem for me as I don’t really like Mal at all, so all of the scenes of their relationship were kind of bland to me. I LOVED Genya in this book. After being less prominent in Siege and Storm, Genya is back with a vengeance in this book and it’s glorious to behold. She refuses to be held back by The Darkling’s scarring of her face and takes on the King in what was probably the most satisfying scene of the entire book. I also really loved her and David, the scene where he tells her that he doesn’t see her as broken and that she doesn’t need beauty as her armour because her spirit is unbreakable was lovely, more romantic than any of the Malina stuff in this book! I liked that we got more of Baghra’s backstory (and by extension The Darkling’s) in this book, it was great to finally see how all of the Morozova stuff ties into the main storyline (Baghra and The Darkling are his daughter and grandson) and having all that context made her inevitable ending pack that much more of a punch. Alina kind of becomes inexplicably more powerful just to suit story purposes, which I guess, fine I can deal with, but for someone who struggled so much to master even basic magic, it seems weird that she picks up this new stuff with ease, after all, she still hasn’t been using her powers all that long and she still has the same number of amplifiers as the last book, so there’s not any real reason why she should suddenly be able to do all this stuff other than we need her to for the story. Still, I loved the whole invisibility thing and found it so cool that Bardugo based it on real science! I thought the twist with the amplifiers was good (I can’t really explain without going into too much spoilery territory, I know this book has been out for five years, but I still don’t want to spoil it for people who haven’t read it) but it did kind of negate most of the first half of the book since searching for the firebird was so integral to that. Getting more of the Darkling’s backstory did make him more sympathetic but I still felt like he wasn’t a fully rounded character by the end of the book, it felt like Bardugo was using the fact that he was this enigmatic character to avoid any real development and I had the same problem as the last book, he’s never really a strong enough presence to feel dangerous, he just shows up, does evil and then goes away again, he appear in maybe 5 chapters of this book total? I don’t know, I just didn’t feel like he ever reached his full potential. I thought the whole final battle was kind of anti-climactic, we’ve built up to this for three books, and yet it lasts a single chapter, everything is dealt with quite easily and even the parts that were meant to be emotional (I can’t elaborate due to spoilers) fell flat. There was just so much planning, so much buildup, that I was expecting something really epic and it just….wasn’t. Again, without meaning to go into spoilery territory for anyone who hasn’t read it, I found the conclusion with Mal, just far too easy. It didn’t feel earned, it felt like Bardugo took the coward’s way out of resolving that storyline and I would have been far more interested to see what would have happened if things had gone the other way. It didn’t feel like Alina had to make any real sacrifice, which we had been promised throughout the book. The epilogue, I have many thoughts about. On the one hand, the ending does make sense for who Alina is as a character and I understand why she would have chosen that ending, but I can’t quite reconcile that fact with that it wasn’t what I would have chosen for her, I think there could have been a way to keep a similar sort of ending without the frustrating parts, but there’s not much more I can really say about it without veering into spoiler territory, so I guess those of you who haven’t read it will have to make up your minds yourself. One thing I will say is that I thought Bardugo already had a killer final line at the end of chapter 18, and I think the line she chose to end the epilogue with was kind of cliche, so honestly I think it would have been a more satisfying ending without the epilogue, and I wouldn’t have really minded not getting a concrete resolution to the ship stuff, since it’s clear enough who Alina chose (that’s a whole different set of issues that again would veer into spoiler territory, if anyone wants to talk to me about it, please DM me on Twitter, I have FEELINGS), I didn’t think we really needed the epilogue to clarify things. Overall, Ruin and Rising was a bit of a disappointing way to end the series, it’s a bit of a problem when the final battle in your second book is more intense than the climactic battle of the trilogy! The plot was limp, the pacing was all over the place and I wasn’t wholly satisfied by the conclusion. That being said, I did love most of the characters (Mal and Alina aside really), the writing was good (not Six of Crows level, but good) and the group banter was brilliant, so it wasn’t a total loss, it just wasn’t a total win either. My next review will either be of Alex and Eliza by Melissa De La Cruz, or Enchantee by Gita Trelease, I’ve already read Enchantee but UK pub date isn’t till the 21st February, so if I don’t finish Alex and Eliza before then, then my Enchantee review will be up first.